How I Gained It: I am a stress and emotional eater. I turned to food, and not just to eat, to eat heavily. I could drink a two-liter bottle or almost a 12-pack of Diet Pepsi. I could eat a pizza or a whole family-sized bag of candy. I would pick meals in restaurants by the volume of food I would get. I had tried diets before at eventful times in my life, like before my wedding and the upcoming birth of my son. 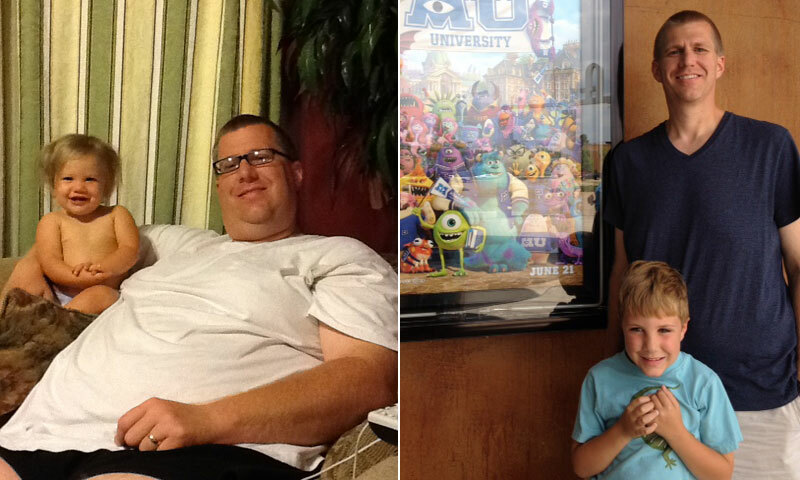 I lost 30 pounds the first time and 87 pounds when my son was born on the Weight Watchers program. However, I did no exercise. Breaking Point: On November 12, 2012, after seeing myself weighing in at 367 pounds, I decided enough was enough! How I Lost It: I’m a teacher, and my school district decided to start paying monthly gym fees for all district personnel. I decided there were no more excuses, so I started the Weight Watchers program again, this time with a gym to assist my efforts. I posted my weight loss on Facebook each week and on my classroom’s board each week as a motivator. At my six-month mark I had lost 100 pounds and was beginning a running program to train for a 5K. I felt like I was dying at first, but the app I used really got me into it. On July 26, I ran my first 5K in 25:53, good enough to be 12th in my age division and 64th out of over 300 racers. I was ecstatic. I plan to start training for a local 10K in January. I love proving that my hard work and exercise is paying off. I’ve controlled my impulse to grab candy and fried foods and turn to apples, peaches and grapes for snacks instead. I cut myself down to one Diet Pepsi a day at first, and now I don’t drink it at all. It use to be a struggle getting out of bed. Now I am up between 4:30 and 5:00 waiting to get the kids ready. I mow the lawn every week. I run three days a week and go to the gym five to six days. I feel confident. People have told my wife that I walk with my head up high and proud, compared to me walking without making eye contact. I am not ashamed anymore or worried if I am going to fit in a seat. My lower back pain is gone. I can go upstairs to my classroom without breathing heavy or breaking a sweat. I actually like to feel the heat now, because I am so cold even at 75 degrees. My wife and kids are amazed that they can actually wrap their arms around me. My students really keep me on the straight and narrow by encouraging me with their kind words. Many people don’t recognize me until they process my new look for a while.